… going beyond many elementary and middle school curricula. Variety is the spice of our Spanish curriculum. We introduce vocabulary with colorful humorous visual aids coupled with gestures as we build sentences and teach catchy songs. Then we sprinkle the class with loads of humor, interactive puppetry (Years 1 & 2), role-play and reading (Years 3 – 5), and many games and activities to make it fun. And we always reinforce earlier vocabulary as we teach new vocabulary. To view examples of live Sing ‘n Speak Spanish classes, go to www.singandspeakspanish.com. Ease your child into Spanish with our beginning Year 1a or Year 1b course! Children learn basic everyday vocabulary themes such as greetings, the classroom, numbers, colors, body parts, weather, days/months, clothing, foods, simple verbs, the alphabet and more. Children continue learning Spanish with our Year 2 course! We cover vocabulary themes such as the city, the house, adjectives, animals, prepositions, transportation, verbs, nature, higher numbers, commands and more. Watch your children make a huge leap with our beginning grammar Year 3 course! Verbs become the backbone of this fun course as children learn personal pronouns, conjugation of many irregular commonly used verbs such as to be, to have, to go, to be able to, to want, to like, and to know. Your child will learn many verb infinitives to go with these helper verbs. Children continue learning basic grammar with our advanced Year 4 course! Verbs continue to be the backbone of this fun course as children learn to conjugate present tense regular, reflexive, stem-changing and gustar-like verbs. Children continue learning basic grammar with our advanced Year 5 course! Students review helper verbs and regular verb conjugation as well as the progressive tense, possessive and direct and indirect object pronouns, prepositions, commands, and an introduction to the past tense. 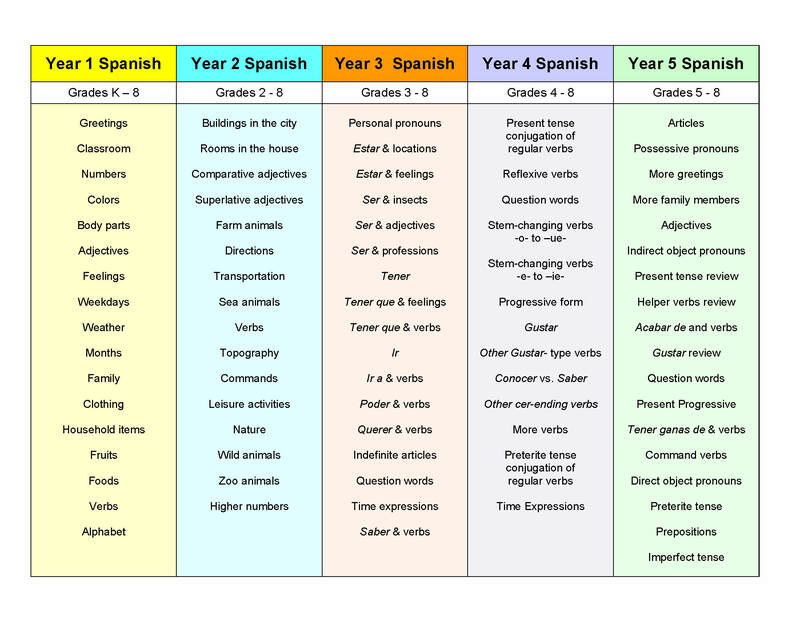 See the table below for a summary of topics covered in our Spanish curriculum and the appropriate grade ranges for each. Go to Spanish Teaching Materials and scroll down to view sample lesson plans, student worksheets, and songs for Years 1 – 5. Skinny Skits and Comedias Cortas, both written by Patti Lozano are a delightful assortment of skits that reinforce conversational Spanish. The 45 skits in Skinny Skits together with our Year 6 Teacher Manual and Student Workbook are used as our Year 6 curriculum. The 33 more complex skits in Comedias Cortas together with our Year 7 Teacher Manual and Student Workbook work well as our Year 7 curriculum. Patti Lozano’s Latin American Legends is a series of 10 stories from Latin America that, together with our accompanying Student Workbook can be used as a supplement for students taking Year 6 or 7 Spanish. Learn more about these products in the section on Support Materials. This is a very flexible curriculum. Go to Scope & Sequence to visualize how this Spanish elementary curriculum can be implemented into your K-8 or K-5 school.